The highlight of the week for everyone in school was undoubtedly having a Planetarium in school all day on Wednesday! This special treat was arranged and provided by the Parents’ Association. 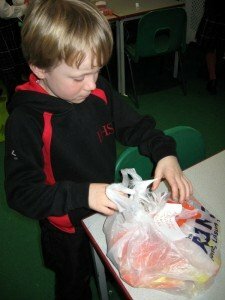 It is through your generosity at events such as Cupcake Fridays, Fairstead Films Nights and other family events that the Parents’ Association can continue to treat us in this way. As you will see further on the Newsletter, the Parents’ Association main fundraising event this year will be the Summer Ball. Everyone is very excited that this year the ball will take place at Tattersalls on Friday 17th May. Do make sure that this date is clear in your diaries! We are looking forward to revealing our next fundraising campaign shortly! 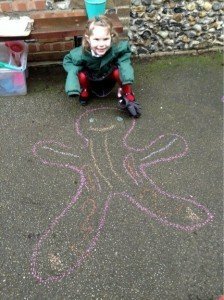 In Reception this week, the children have enjoyed reading the story of ‘The Gingerbread Man.’ They have been keen to write to him with their expert advice on how he can avoid being eaten by the fox! 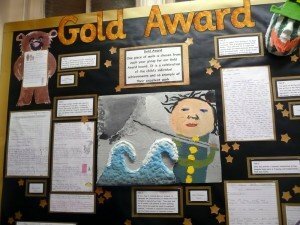 There were some super ideas – please do come in and see them on display. 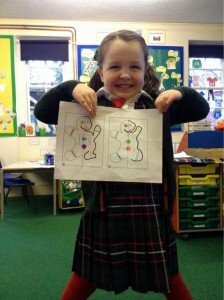 The story has also been the inspiration for creating repeating patterns and symmetrical patterns in Maths and has supported developing balancing skills in P.E. 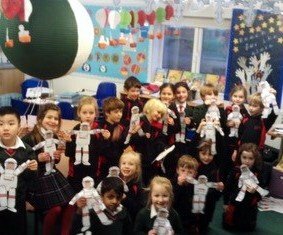 The Planetarium visit caused great excitement this week and the children particular enjoyed finding out facts about Space to share with their Gingerbread Men! Visiting the forest was great fun as always! The children ran straight to their bird feeders to see if their food had been eaten. 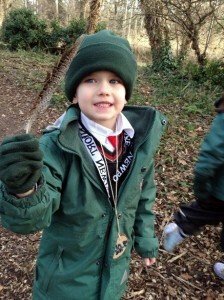 The RSPB ‘Big Garden Birdwatch’ begins this weekend and all children in Reception have taken home their own feeders to share at home. We hope you have fun spotting as many birds as you can! 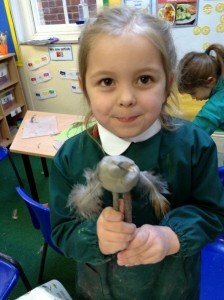 The children enjoyed learning the names of some woodland birds, to help them with their bird spotting and compared them to ‘Birds of Paradise.’ They ended the afternoon by making their own clay birds using natural resources collected from the forest. Year 1 went off to Paris this week! Their first stop was the Eiffel Tower then the Arc de Triomphe. They were feeling a little peckish so stopped off for something to eat. Mrs Scott offered the children snails but the children turned them down for croissants and pains au chocolat, which were very yummy! The last stop was the Louvre Museum where they saw the Mona Lisa. 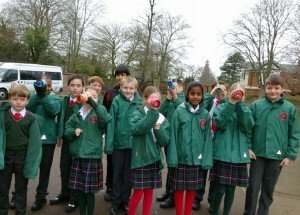 They then had to travel by hot balloon back to Newmarket because the next day they were off to outer Space to learn all about our solar system. 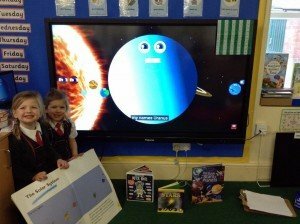 Year 1 had a wonderful time in the Planetarium before making their way back to Earth to study Space maths, make astronauts and write about their time on the moon. If the children felt jet lagged after New York, they were most definitely in need of a rest after this week! 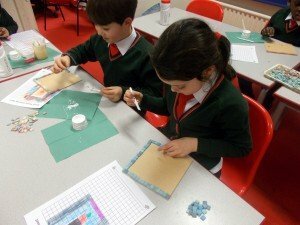 Year 2 enjoyed a Space themed day on Wednesday! 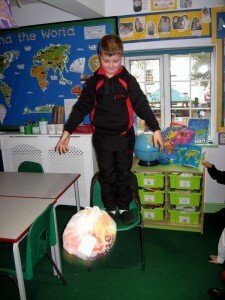 The children were very excited to receive a challenge direct from NASA headquarters. 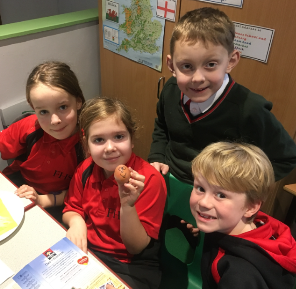 The children were asked to make a ‘moon lander’ that would safely land an egg on the moon- that meant absolutely no cracks! 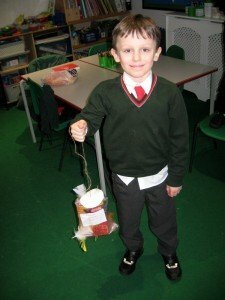 Each group had great fun selecting suitable materials and then building a capsule to protect their eggs; some of the designs were very inventive. 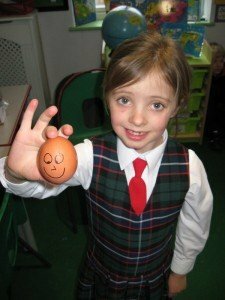 All but one of the eggs landed safely and intact- well done, Year 2! As part of their curriculum topic, Vesuvius! 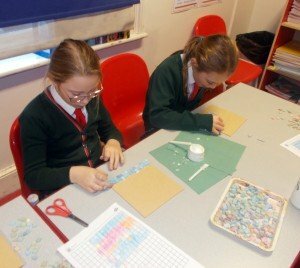 Year 3 have been exploring Roman Mosaics in their specialist Art lessons. 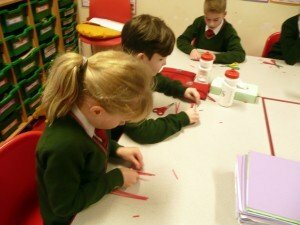 They have finished their designs and are now beginning construction! 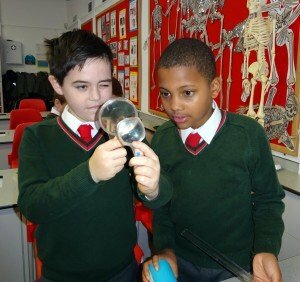 In Science this week, Year 4 furthered their learning of sound by exploring pitch. 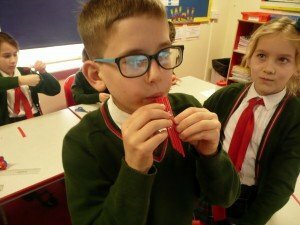 They used a range of percussion, woodwind and string instruments to investigate how high and low sounds are made. They identified a link between the length of the string or bar and the pitch. 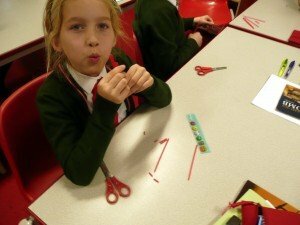 Using only scissors and craft straws, they were challenged to create high and low sounds. The results were miniature panpipes and a perfect demonstration of pitch! 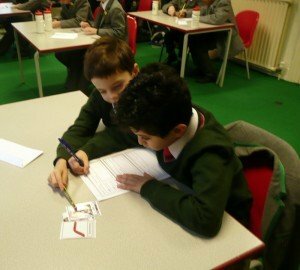 Whilst the girls were enjoying their choral day at Framlingham School, the Year 5 and 6 boys enjoyed some team building and reasoning activities. As part of this, the boys played ‘odd one out’. In their teams, they had to agree which object was ‘the odd one out’, providing a reason for their decision. Thinking outside the box was rewarded with the less obvious and more obscure explanations earning points. On Wednesday. 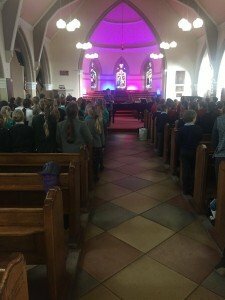 Year 6 experienced a wonderful visit from the travelling Planetarium, which complemented their topic on Space. 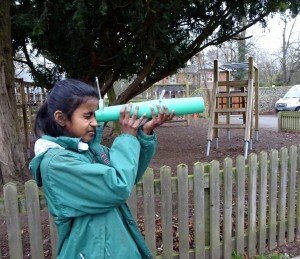 The children then enjoyed making their own telescopes in Science. 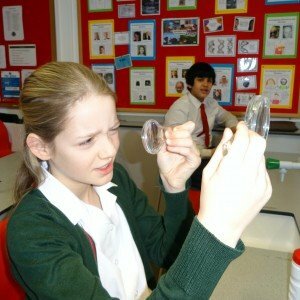 They first investigated the distance between 2 magnifying glasses to find the best focal point. Next, with a partner, they measured this distance and used card to create a telescope with the magnifying glasses in the correct place. This was much more difficult than it sounds! 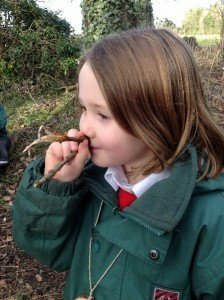 Finally the children put their creations to the test outside. 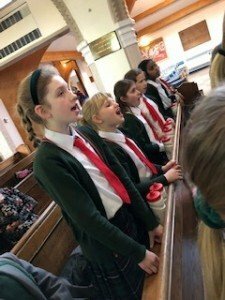 On Wednesday 23rd January all the Year 5 & 6 girls attended a Choral Day at Framlingham College. 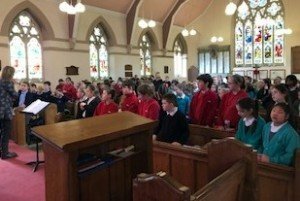 Over 100 pupils from various schools took part rehearsing songs written and conducted by Lin Marsh, a prolific composer who has written music for BBC children’s programmes for both television and radio. Lin has worked extensively in music education in all sectors and with organisations such as the London Mozart Players, Birmingham Symphony Hall Education, The Royal Opera House Education department, Glyndebourne Education, Opera North and Youth Music Theatre UK. Lin Marsh is much in demand for vocal coaching linked to Music Theatre singing and works both in the UK and abroad with groups of teachers and young performers. We were very fortunate to have been given this opportunity to attend this workshop, with one of the UK’s most well-respected singing leaders. It really was a wonderful day which was beautifully thought through and presented in an inspiring way. 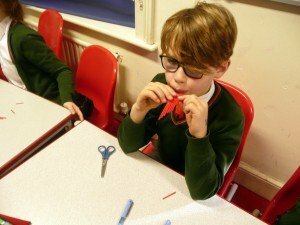 At Fairstead House, there are many extra-curricular lessons in a wide variety of musical instruments available, such as the clarinet, flute, piano, ukulele, banjo, violin and cello to name a few. 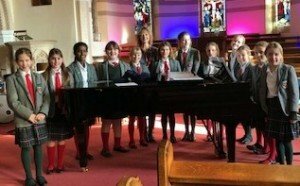 We have enthusiastic teachers, under the leadership of our Director of Music, Mrs Karina Warburton, who are dedicated to inspiring the children with a love of playing music. Some children have already taken ABRSM music exams: Matilda in Year 4 passed her Descant Recorder Grade 1 and Dylan, also in Year 4, passed his Grade 2 Piano. Evie in Year 5 passed her Grade 1 Clarinet with Merit. If you are interested in your child receiving private music tuition then please do contact the School Office. 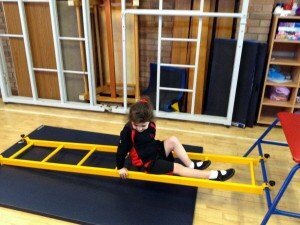 Those of you who joined us for our ‘Starting School’ evening in September heard that we are actively looking for alternative venues to enhance our Games provision. You may also have seen in the local press that our vision has been shared with the Town Council and we will, naturally, share any developments with you if and when they arise. 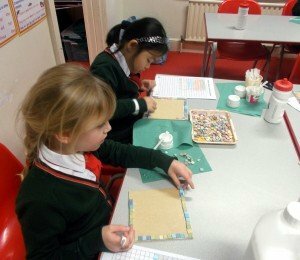 A gentle reminder to all parents to ensure that your child has a clean napkin in school to use at lunchtime. Thank you! Years 3 and 4 are hosting a Cupcake Sale after school. Cupcakes will be sold for £1 each so please do bring your spare change! Al parents of children in Years 4 and 5 are invited to join us for an informal evening when we will be discussing the process of choosing and applying for your child’s senior school. Please do join us in the Performing Arts Centre from 5.45pm for drinks to start promptly at 6.00pm. ‘It is absolutely wonderful to report that the first two students to take LAMDA examinations with me, Giselle and Zara, achieved wonderful results this week following exams taken last December. Giselle passed her Grade 2 Solo Acting with Merit and Zara passed her Grade 3 Solo Acting with Distinction. Many more students are taking their examinations this coming April and it is a joy to see these children grow in confidence and self belief. To see their horizons expand through new literature is one of the reasons I teach. So many of my students too, choose not to take exams but purely do drama for love. I am currently looking at taking on new students for the new academic year from September 2019. This may seem early to be looking ahead but it may be necessary to adjust my timetable to coming to Fairstead House on more than one day per week as I have so many students and parents interested. If you wish to provisionally book a place for September please e-mail me on jwoolf2019@gmail.com and I shall respond as soon as I am able. This week, we wish a happy birthday to Giselle in Year 3 and Theo in Year 4.